One thing I learned over this past week is that I deeply enjoy the companionship of my friends and my adventures with them, but when I work, I work alone. 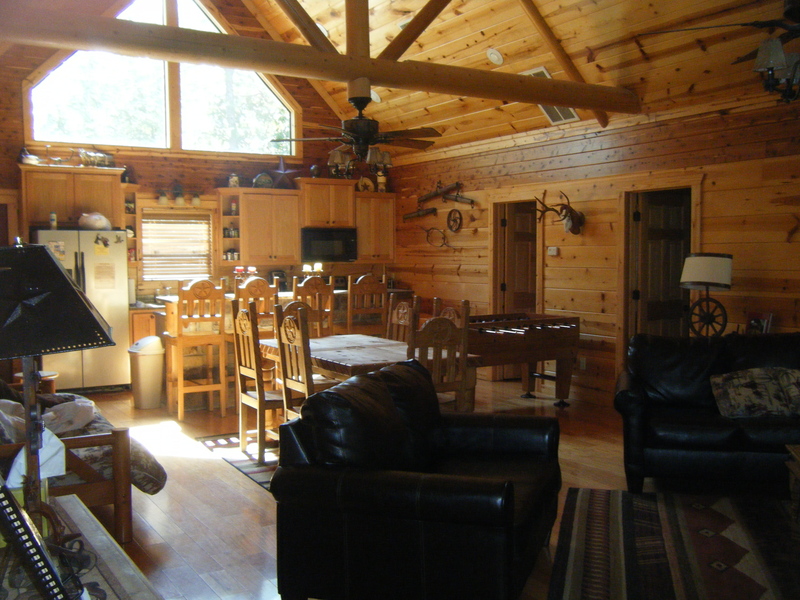 The cabin where we spent our writer’s retreat was spacious and beautiful. We could more than easily spread out in the great room to cook, eat, write, read, chat, and more. It was a rare time (other than eating) that all five of us were immersed in the same activity, but we could still be silly and carry on conversations and I loved this. However it took me no time at all to realize I could not work in this environment. In part I get distracted and want to join in on conversations. After all we don’t often have so much time dedicated to nurturing friendship. All too often that time is eaten away by family and work responsibilities. In part I find chatter and bustle annoying when I try to focus on reading or writing. This is no fault of anyone around me (unless they purposely strive to irritate me), but it is the equivalent of a foghorn going off every time you open your mouth to speak. No one can hear you and I can’t hear the words in my own head. I was looking forward to this retreat because I dearly wanted some time with my friends. We have all needed this for a variety of personal reasons. I was also looking forward to this retreat because I desperately needed time to work. I needed time to write poetry, to read books, and to work on this blog and the Ferret blog. Because of this time I spent much of my time on the retreat alone. 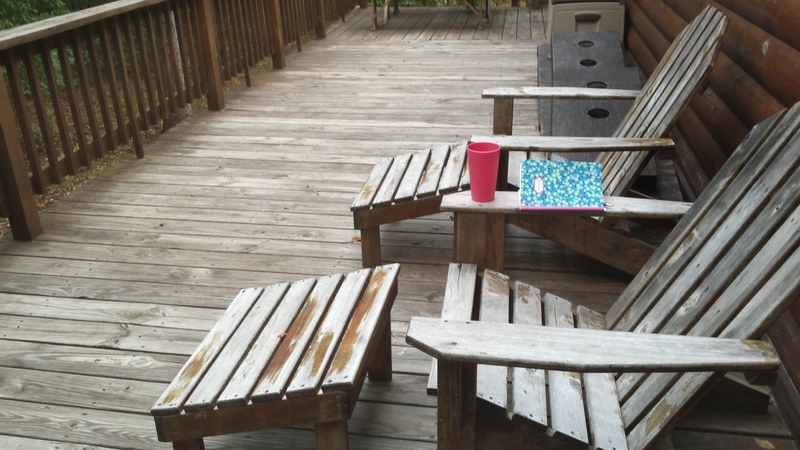 The enormous wrap-around deck of our cabin was perfect in allowing me quiet, sunshine, a good breeze, and the companionship of some ornery gray squirrels who found great fun in throwing hickory nuts off just about any surface they could find. It had nothing to do with wanting to ignore my friends and everything to do with needing this for me. Sometimes being a creative artist means you make difficult decisions about where you place your time. (Decisions I’m not usually very good about making.) Thankfully this time I was on a writer’s retreat, and no one thought much of it when they caught a glimpse of me sliding out one of the doors, notebooks and pen in hand yet again. In the end, I was productive. Four blog posts written, several more planned, two books read, and one poem fully finished, in addition to putting in work on a couple of others. All in three days. And that was still allowing plenty of time for general silliness. I’m proud of myself, and I am hoping to keep up the work even if the pace slows a bit now that life once again has chores to keep up with and an office that demands 40 hours of my time each week. Sounds like this was a super productive trip for you, Lissa! I’m so happy for you. The cabin looks amazing… I would love to stay there for any number of days! That’s bizarre… Since my Gravatar is connected to a WP.com site (I think!) I do know that there is a hidden place in your blog settings where you can change it on WP.com. What I see right now is lissaclouser.com, but when I get an email notification, it doesn’t give me any of your recent posts or a way to find you via your Gravatar. It is correct in the spot you told me. T_T Weirdness. When I first set up Gravatar I was able to link the old blog just fine. I think it’s grandfathered in? Like if you already have it there, you’re set. You just can’t set up anything new? I’m so sorry! This is the only site being updated now, if that helps. I will eventually delete the other one entirely. For now it is set to ‘private’.